My 7 year old daughter Brielle is wearing the costume. She wanted to be a baby but also wanted to be something a little creepy and scary so we came up with this idea. Through trial and error, we figured out hot to make it. We started with a rolling backpack and rolled the rails up. Then we duct taped a hanger to the top of the roller. We bought a mask and put it on a styrofoam wig head and put a dowel through the hole on the bottom and ducted taped this to the hanger. Used pool noodles for the shoulders . 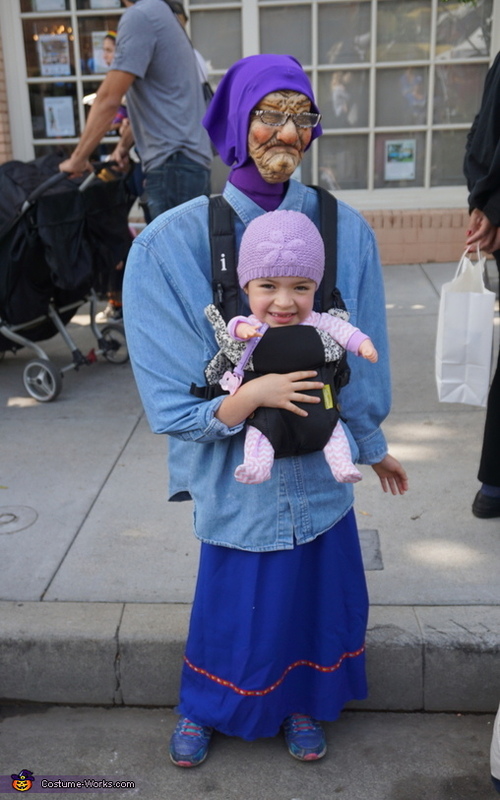 The wardrobe consisted of an old shirt and skirt, baby carrier, and a baby doll with the head chopped off.